Genuine AP 4 Pot Calipers (RED). Genuine AP 315mm Diameter Discs. Does not affect the ABS or ESP systems. The AP 4 Pot Brake Kit has been the choice of the ST enthusiast for many years. Now the new Fiesta ST180 2013 has the same AP treatment. Give your ST the ultimate Braking power. 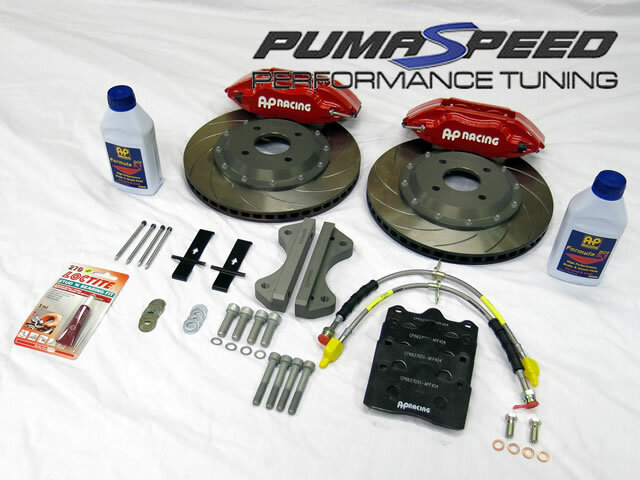 Tested on the track, this newly developed 4 Pot Brake Kit will work perfectly on the road and on the track. Will require a Hub spacer. The Pumaspeed Workshop team are ready to fit the Fiesta ST180 Ecoboost MK7 4 Pot AP Brake Caliper Kit 315mm in our Head Office located here. Therefore making parts and labour a total cost £2,308.37 (inc. VAT). Pumaspeed have a specialist distribution team that can dispatch the Fiesta ST180 Ecoboost MK7 4 Pot AP Brake Caliper Kit 315mm to any destination worldwide.